With Razorback Football season upon us, we receive many questions related to parking and road closures. For every home game, traffic headed onto the University of Arkansas is limited to parking passes for assigned lots only, four hours prior to game kick-off. If you have a parking pass, with a parking lot number, please have it displayed on your rear view mirror, so officers can see it, and allow you passage. For more detailed information please visit Game Day Information. Most lots will be reserved on game days for Razorback Foundation members who are season ticket holders. Parking passes for Fayetteville games at Donald W. Reynolds Razorback Stadium are available through the Razorback Foundation. 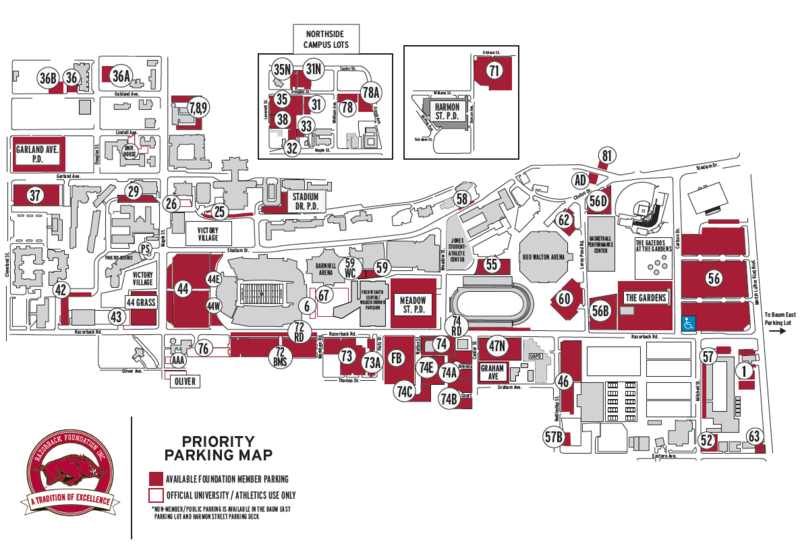 Please refer to the Razorback Foundation’s priority parking map located here. Pay parking is available at the Harmon Avenue Parking Garage located north of Center Street on Harmon Avenue. There is a $20 charge per vehicle for parking. Spaces are available on a first come, first serve basis. Free off-campus public parking is also available off of Razorback Road near Baum Stadium approximately one mile south of the stadium between Martin Luther King and 15th Street, with a free shuttle service. ADA parking is available on a first come, first serve basis in a designated area in Lot 56, located on the corner of Martin Luther King Blvd. (6th Street) and Razorback Road. Overflow ADA parking is available at Baum East. A state-issued license plate or hang tag will be required to enter the designated ADA parking areas in each lot. A shuttle is available from both lots and drops off/picks up at Gates 1 and 8 (both on the west side of the stadium) and Gates 14 and 16 (both on the east side of the stadium). Because of the high demand for the shuttle service from Lot 56 and Baum East, ridership is prioritized by those patrons who have a disability and one caretaker for riders needing additional assistance. There is no fee to ride the shuttle.